Larry Niven and I wrote “Mice Among Elephants” because the recent LIGO discovery of gravitational waves excited our interest. We had set up in our two previous novels together, Bowl of Heaven and Shipstar, a mystery about the target star of an interstellar starship, Glory. Glory seemed to be a normal solar system – so how did radiate such powerful gravitational waves? As a gravitational wave moves through space, one transverse direction stretches space-time itself, while in the other direction, space-time compresses. But gravitational waves are very weak – so how to make them, short of using masses greater than stars’? So the humans venture near and find a small system of black holes. The key is that orbiting black holes, carrying the mass of Earth itself, are still only millimeters in size. They can orbit in small spaces. And inside that volume, the black holes don’t have to follow nice, orderly orbits like the planets we know. Instead, gravitational effects in strong fields (for which you need General Relativity) lead to orbits that can wrap in close, then speed out—whirl and zoom orbits, physicists call them. See the figure—not your mother’s good ol’ ellipse! But…why build such a thing? LIGO discovered a natural emitter, waves given off in the collision of black holes with tens of stellar masses. Turns out that the system in our story emits gravitational waves artificially, in a repeating pattern. It’s a signal! But…why go to such extremes, shoving planetary masses around? And…who would do such a thing? Larry and I have largely written sf to explore such what-if puzzles. That’s a way of thinking your way into a drama that stretches the mind. The story brushes against such issues, with more to come in the next novel Larry and I will write together, which concludes the trilogy. 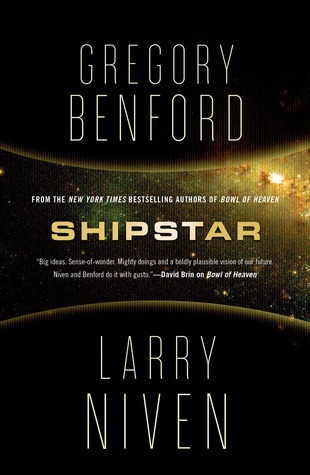 Bowl of Heaven and Shipstar, and the final novel, Glory, are ways of asking—What could intelligence do, given time and room, on the scale of our galaxy? We set out to do the whole idea in one big novel, Bowl of Heaven, back in 2010. . . and found it just grew and grew. This story is a way of inching into the Big Questions we set for ourselves. Plus, it was fun to write—which for us, is the main point, really.